Cocker Spaniel stands about 5" tall and is cut from maple. Price: $15. Slim and Fleet are cute dragons cut from 7/8-inch thick Chakte Kok, a colorful Latin American hardwood. Red Fox is cut from 7/8-inch thick Chakte Kok, a colorful Latin American hardwood. Price: $25, plus shipping. 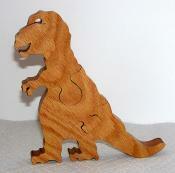 The Giraffe Trio stands about 8" tall and is cut from maple. Price: $20, plus shipping. Rearing Unicorn is cut from aspen and stands about 9 inches tall on his two rear legs. Price: $20. Polar Bear is cut from 3/4-inch aspen and stands about 4 inches tall. Price: $15. Pig (at left) is cut from 3/4-inch walnut and stands about 4 inches tall. He's also available in oak, maple or ash. Price: $15, plus shipping. Take your pick. 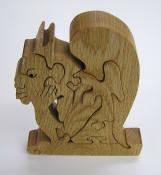 Both gargoyles are cut from red oak and stand about 6" tall. Sitting Persian Cat is about 6 inches tall. Price: $15, plus shipping.